How precise do you need your capture to be? If you can live with the distorted packets, do a local capture. If you can’t, and you need your capture to be precise (which is especially true for most troubleshooting cases where timings or connection aborts are involved), you need to do something better. It boils down to having a dedicated capture device at hand, that is completely passive (meaning: not creating/sending any packets itself) and which records all the packets it sees on its network capture card with the highest precision possible. So we’ll look at capture setups using a dedicated capture device for now. Or that 10Base2 coaxial cable with the T-connectors and the cable end terminators? Yeah, life was simple back then – well, not really: the network was pretty unreliable, the terminators failed all the time (at least it felt like they were), and if you had 5 hours for a Friday night LAN party it took at least 3 hours to get the network up and running (having “known good” spare terminator resistors was vital back then ;-) ). As you can see, the network card of the “Capture Device” will see everything that happens on the network, as will any other device present and running. Now, the problem with hubs is simple: in a shared medium, collisions occur when two nodes try to talk at the same time (think Walkie Talkie: only one can press the talk button or nobody will hear anything). That’s what’s called “half duplex” – listen, or talk, but not both. The binary pattern 0101010101[…] is an Ethernet preamble which is used to signal “Hey, I want to send a packet” and in the decode shown above in Figure 2 it collided into a packet that was already starting – so you can literally see a collision that happened while the packet was being captured. Now, to improve Ethernet performance, switches were created. And when hubs are like Walkie Talkies, switches are like telephones: you can talk and listen at the same time (well, technically. In reality, men usually can’t. Women often can. They do have better multitasking features I guess ;-) ). Being able to send and receive at the same time is called “full duplex“. A network capture device on a switch will not get any packets belonging to a conversation (“Unicast”) between two nodes on that switch, or between nodes on other switches that will pass the switch the device is connected to. And that’s simply because the capture device is not the real target for the packets. The “Target” is specified by the destination MAC address, in case you’re wondering, not by IP address or anything else – switches are layer 2 devices, which means they basically work with MAC addresses. So the capture device will only receive packets that are sent to all nodes (“Broadcasts”) and maybe some packets that are sent to groups of nodes (“Multicast”), depending on how the switch handles Multicast packets (I’m not going into Multicast aware switching at this point). And the reason for that is that the switch has an “inventory” of all nodes connected to its ports, so it knows where to send Unicast packets to. Using switches instead of hubs basically means that network analysts lost their easy access to all packets on the network, and it won’t ever be that way again – so anyone asking for things like “I want to capture all packets in our network” – there’s just no way to do that anymore (well, realistically. You can try to get close to something like a full scale network capture, but it’ll most likely kill your network productivity big time). Question 1: how many Unicast packets will a capture device record on a switch like the one in Figure 5 if it keeps capturing for a while? Wrong. It will pick up single Unicast packets every once in a while, but just one per connection. The reason for that is that the switch removes entries from it’s location inventory after a certain duration and learn its location again. This feature is important to allow nodes to be unplugged and moved to a different port, because otherwise packets would end up at the old port and never reach the node at the new port. To learn about which port a node is connected the switch forwards any packet it doesn’t know the destination port for to all ports. This is also called “port flooding” or “MAC flooding“. The switch hopes that the destination is connected at one of the ports, and when an answer packets arrives on one of them, it adds that port to the inventory again. All further packets after the flooded packets are forwarded to the port it just learned, and the capture device will not see any of them until the next flood. Question 2: So what happens if packets are sent to a destination that doesn’t exist or never answers? Well, the switch cannot learn the location, and keeps flooding the packets. Question 3: What if a packet is only passing through another switch I’m not even connected to, can I capture that at all? No. The packets will not come and visit the switch you’re connected to just to be picked up. You need to capture where the packets are passing through. This is like watching cars in traffic on a street from a window of a building – if you don’t have a line of sight to the street they’re on you can’t see them. To be honest: We will see later that there are some solutions to this problem, but in my opinion most of them aren’t pretty (read: they hurt capture precision, and I don’t like that). “Dumb” switches that do not have a feature like that. They are usually very cheap and found in consumer stores. When it comes to network captures those switches are showstoppers: you can’t capture packets with them in any useful kind of way, because all you’ll get are broadcasts, sometimes multicasts and a few random unicast packets. By the way, this category includes almost all consumer DSL/cable Routers with multiple LAN ports – these are just dumb switches. “Old managed” switches, which can be configured (usually using Telnet, *argh*), which do not have a SPAN/mirror feature – I’ve seen those at hospitals sometimes (3Com devices), and yes, it was in 2009. My advice: replace at the earliest. “Managed” switches, that can be configured via web browser, SSH or any other protocol. Those cost more than dumb switches, depending on their feature set. My recommendation is to always consider buying managed switches. “Hard wired mirror port” switches. Those are switches that can’t be configured via software but come with a hard wired mirroring feature, e.g. copying all packets entering and leaving port 1 to port 5. You have to disconnect the link to insert the TAP, and disconnect it again if you want to pull the TAP back out at some point. This isn’t a big deal for a user PC connection, but often quite complicated to do on a backbone link that has to stay connected 24/7. I will cover TAPs and their features/advantages in at least one later network capture blog post, so let’s leave it at that for now (this sentence is important to keep TAP vendors and Tim O’Neill from “ahem“ing me :-) ). Starting a network packet capture is not complicated, even though it used to be trivial in the days when we still used hubs to connect nodes to a network – everybody got everything. 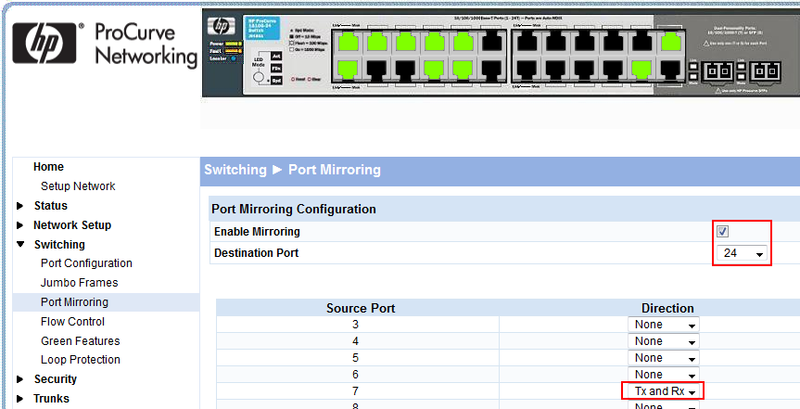 Now, we’re using switches everywhere, so we need port mirrors / SPAN capabilities, or use TAPs. If your switches can’t mirror packets, you’re not going to be successful with packet captures unless you deploy a TAP. We will see in later chapters that some capture setups can get quite complex with many details to consider (especially in virtual environments), but for now, this should be enough. In a way, capturing packets on a WiFi is similar, because wireless allows anyone to see everything (if in range, of course). But WiFi captures have their own complexities as well, mostly because you’ll have to deal with radio waves, different channels, signal strength and encryption most of the time. In the next part to come we’ll look at the role of network cards, link speeds and other things that may become relevant in a capture situation. Quiz question 1. It’s a very,very tricky and interesting one. Different sources say different things, but in many cases a switch resets ARP cache timer if it sees a frame from a node. I tried to monitor my old Cisco 2950 and yes, it seems that ARP-cache entries for active addresses do not expire. Juniper, Huawei documentation has similar descriptions. -switch OS and settings have influence too. If the sender has not had any conversations with the receiver before, the first thing it would do is sending ARP request (that is broadcast, not unicast). So, my answer to the question is: yes, we have a probability to capture unicast frames, but it’s almost impossible to predict rate and number of these. The probability will be higher if we have changes in the network. Otherwise if the network is stable, we can spot unicast frames quite rarely. Cool question again! Thanks, Vladimir, and valid points regarding the flooding behavior – I’ve seen switches in many situations that keep flooding single packets periodically even without ARP, but I can’t tell anymore what vendor and model they were as it was years ago. Nice article. And so I thought zero. But … yes it depends. Most of the (ZyXEL, Raisecom) switches I work with (appear to) fill their MAC table based on ARP requests and “Gratuitous ARP packets” which pass through the switch. And (appear to) reset the MAC time-out when the MAC is used. I usually see no unicast packets (intended for other devices) unless I have activated mirroring or are hubbing-out ;-). Besides hub, miror port or span devices, routers often have tcpdump on-board. The biggest limitation is the memory space. In that case captures came be made without needing to be on site. But regardless of what you are using (the router itself, a hub, mirror port or span device) everyone should always remember that packets can get lost. And where the packets can get lost. Jasper! I have one network topic which always confuses me a bit. Maybe you can give me a good answer or even blog about it? I am talking about “untagged traffic” vs. “tagged traffic”. Especially the differences (if there are any?) and the naming and handling from Cisco compared to other vendors, e.g., Dell. Coming from Cisco, you have untagged traffic (access port) and tagged traffic (trunk port, sometimes with a default vlan for untagged traffic). Ok. But working with Dell switches, you also have PVIDs and stuff like that. Even if I configure a port to be a trunk, I must configure a PVID, too. Why? Is it only the naming of the default untagged traffic of a trunk port? Are there any other differences? If I remember correctly, Dell uses the PVID to tell a switch how to tag incoming packets that do not carry a VLAN tag – so you basically migrate an untagged packet into a VLAN by the PVID you specify. Cisco and HP simply migrate incoming packets without a tag to the VLAN the port is configured for as untagged. Great post, and yes I am old enough (although I prefer to use the term experienced enough :) ) to remember installing the think and think yellow ethernet coax (RG8 and RG58 as we used to call it in the UK). I can see you go to a lot of trouble on your blogs with the graphic and so on, great job. I have been using the Netgear Prosafe switches as a low cost option when my full fledged Taps are in use elsewhere. Looking at the Dualcomm I can get at least two for the cost of one Tap and the USB power is nice for when I send a tech out to the floor for a capture. They would not have to plug into the cabinet power to run the ‘tap’. I am looking forward to playing catch up on the rest of this series!